1. Bishop Amat (0-1) — Coaches have LOTS to figure out for Servite. 2. Charter Oak (1-0) — Rolled in Vegas, but true test comes Friday. 3. Glendora (0-0) — First up is Alta Loma. 5. La Habra (1-0) — Defense, say what? ?, defense looked good. 7. West Covina (0-1) — Doesn’t get any easier with St. Francis next. 8. La Serna (1-0) — Margarito-less Lancers got narrow win. 9. San Marino (1-0) — Offense picked up where it left off. 10. Northview (1-0) — Took care of business against Rosemead. 11. Los Altos (1-0) — Didn’t miss a beat vs. Baldwin Park. 12. Bonita (1-0) — Think Medrano wants revenge vs. M-Town? 13. Damien (0-0) — Bit of a guessing game right now. 14. South Hills (1-0) — Defense delivered win vs. D-Ranch. 15. San Dimas (0-0) — The Post-Z Era begins Friday. 16. Monrovia (0-1) — Can ‘Cats bounce back vs. Bonita? 17. La Salle (1-0) — Up next: Blair. Blair? Yes, Blair. 18. St. Paul (1-0) — Hearing good things about Swordsmen. 19. Muir (0-1) — Doesn’t get any easier this week vs. Cathedral. 20. Montebello (1-0) — Third shot at Northview in a year’s time. 21. Diamond Ranch (0-1) — Offense was nowhere to be found. 22. El Rancho (0-1) — Offense appears to be way down. 23. La Canada (1-0) — Sparty wins Coach Zerbel’s debut. 24. Diamond Bar (1-0) — Nice win over Duarte. 25. El Monte (0-1) — Talent is there, but Lions hurt themselves. As reported by our Steve Ramirez Thursday morning, La Serna High School has fired head coach Margarito Beltran. The move comes just a day before La Serna opens the season against Eastlake on Friday night. The reasons given are somewhat vague (at least to me). This is the second peculiar thing this year about Beltran’s status at the school. Going into spring practice and the summer passing circuit, rumors swirled that Beltran was no long the Lancers’ coach. He put those to rest by saying he had taken medical leave and would return in time for the season, which looked exactly like what was happening. Regardless, Beltran was one of the best around. His teams were an annual postseason force. His program one of the best around. His systems/schemes excellent. Get the point? This is the kinda guy who will likely catch on somewhere else. Andy George, a La Serna assistant, will take over as the head man. 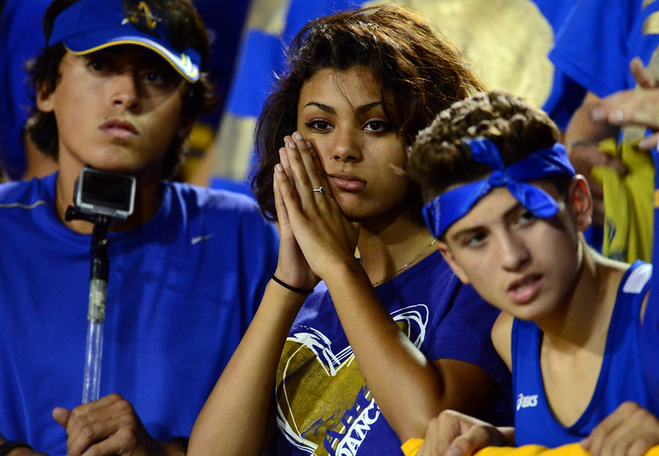 If the Bishop Amat High School football team comes up in its season opener against Mater Dei on Friday night, the reasons will likely hit close to home. In a strange twist, two of the San Gabriel Valley’s most talented players won’t be in uniform for Bishop Amat, but Mater Dei, instead. And the question on a lot of people’s minds is how did these two get away. Kickoff is 7:30 p.m. at the Santa Ana Bowl. When Mater Dei throws on Friday night, the Monarchs will likely target 6-foot-5 receiver Andre Collins Jr., who doesn’t live anywhere near Orange Country. Nope, Collins Jr. lives in Hacienda Heights. And protecting the Monarchs’ quarterback so that he can get Collins Jr. the ball is USC-bound offensive tackle Frank Martin II, who lives in West Covina. Both Collins and Martin have been carpooling to Santa Ana since their freshmen year. Forget about Amat, why didn’t Martin go to West Covina, which was coming off a dominant showing in the CIF playoffs when he was entering high school. “His dad went to school here and graduated right when I started coaching,” West Covina head coach Mike Maggiore said. “I did not know he had a kid and his kid was 6-4 or 6-5. But a couple kids told me there’s a big kid in West Covina and they didn’t know where he’s going to go. In this case, it turned out to be a high-level Division 1 prospect. But I don’t feel like we ever had a chance. He never came over to look at our school. Although neither Collins or Martin wound up as Hagerty’s responsibility, they will both certainly be his problem on Friday night. Collins appears on the cusp of a breakout season and will be tough to cover given his frame. Martin should be quite an issue for an Amat defensive line that is dealing with injury and suspension. High expectations and El Monte High School never used to be found in the same sentence. For far too long, the Lions were an area also-ran. The playoffs were a rare occurrence and you can forget about winning the Mission Valley League championship. But all of that has changed. As the dawn of a new season beckons, the Lions are thinking big. League championship big. Prolonged playoff run big. The culture change that head coach Joel Sanchez so badly wanted has finally materialized. After being a doormat for so long, El Monte broke through in 2011. The Lions won a share of the Mission Valley League championship for the first time since the late 1970s and followed it with their first playoff win in as many years when they edged Montebello in a last-second thriller. What was thought to be a once-in-a-generation team back in 2012 has actually proven to be a catalyst. Sure, El Monte followed that season by winning only one game in 2013. But last year, the Lions bounced back, won six games and finished second in league. 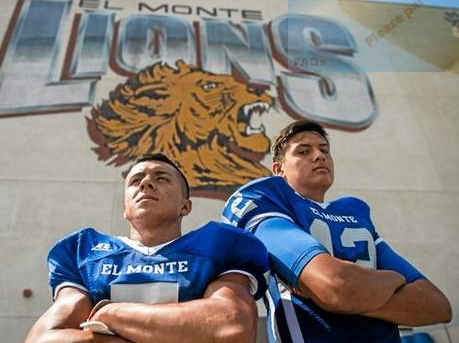 With so many key players back from last year’s team, El Monte is once again a legitimate league title contender. The Lions have some of the top skill players around in running back Roy Barajas and quarterback Edward Dominguez. The reason why Sanchez can be so confident that things will always turn around is because his program now has a foundation under it. Sanchez, an El Monte graduate in 1997 before going on to play linebacker at Azusa Pacific University, knows exactly what type of student athlete he’s working with because he was once a El Monte football player himself. Then there’s what Sanchez calls “the little things.” It’s not uncommon to see the Lions football players jogging around town in their cammoflauge shorts while stopping at local businesses and city buildings to get acquainted with what they hope are their fans. El Monte traditionally rocks some of the best spirit pack gear around, affordable only by extensive fund raising. But Sanchez wants his players to look the part and the kids are all too happy to wear it. The team barbecues steaks on Fridays for team meals and often has offseason barbecues just because. There’s also a popular trip to Mammoth Lakes made every summer for just the team captains and coaches. Once far from home, the captains and coaches lay out their goals for the upcoming season. Sanchez has seen those goals change through the years from things like beating rival South El Monte to winning the league championship. This year, the big desire is to beat Rosemead, which is the defending league champ and has owned El Monte recently. On Friday, Montebello will come to El Monte looking to spoil the party. The Oilers may not have any players who played in that heartbreaking 2012 loss, but the coaching staff definitely remembers. Sanchez knows opening the season with a team like Montebello can send a big message, win or lose.